Home values are now at three times the median income -- that's 15 percent higher than they have historically been, relative to what Americans earn. As rates rise and push mortgage payments higher, people are going to realize that homes -- and not just mortgage payments -- are overpriced for what the nation as a whole earns, which in turn could send home prices tumbling again. Sales figures for single-family homes in Santa Clara and San Mateo, the two main counties in Silicon Valley, show median prices have risen about 30 percent in the past year while the inventory of available homes has fallen by roughly half, according to an analysis of local multiple listing service data by the Silicon Valley Association of Realtors. The median prices for March -- $735,000 in Santa Clara and $925,000 in San Mateo -- only hint at the current market's frenzy. Each property now typically attracts between 10 and 30 offers, eventually selling from 5 percent to 25 percent above the asking price, said Moise Nahouraii, the owner of Referral Realty in Cupertino. Jeff Barnett, a former president of the association and a regional vice president at Alain Pinel Realtors, said 30 percent to 40 percent of sales were paid in cash. "Last year, the market came up," Mr. Barnett said. "This year, it's on fire; it's just unreal." Case-Shiller data for January showed the 10-city composite jumped 7.3% over the past 12 months, while the 20-city index surged 8.1%, its fastest levels since before the housing collapse. Some suggest the current state of the housing market is artificial, and that it will eventually face a correction. The problem with this conversation is that it's like discussing the future of shipbuilding from the deck of the Titanic. I just shipped the bed! You think it'd be impossible to share your house with your wife, your daughter, and fifty million or so Argentine ants. And you would be correct. Do you know, or are you guessing? Do you know, or are you guessing? You're guessing, aren't you? No points! 0! You don't get any points for guessing! There is so much you can't know about your spouse when you get married, like that one day she will want to eat her placenta. 23% of all mortgage borrowers in the US are underwater. Imagine if they all walked. Don't feel guilty about it. Don't think you're doing something morally wrong. 2) exaggerated anxiety over foreclosure's perceived consequences. Moreover, these emotional constraints are actively cultivated by the government and other social control agents in order to encourage homeowners to follow social and moral norms related to the honoring of financial obligations - and to ignore market and legal norms under which strategic default might be both viable and the wisest financial decision. Norms governing homeowner behavior stand in sharp contrast to norms governing lenders, who seek to maximize profits or minimize losses irrespective of concerns of morality or social responsibility. This norm asymmetry leads to distributional inequalities in which individual homeowners shoulder a disproportionate burden from the housing collapse. The Fiserv Case-Shiller Home Price Index forecasts that average single-family home prices will fall another 11 percent over the next twelve months, with declines expected in about 90 percent of the more than 350 metro areas tracked by Fiserv. 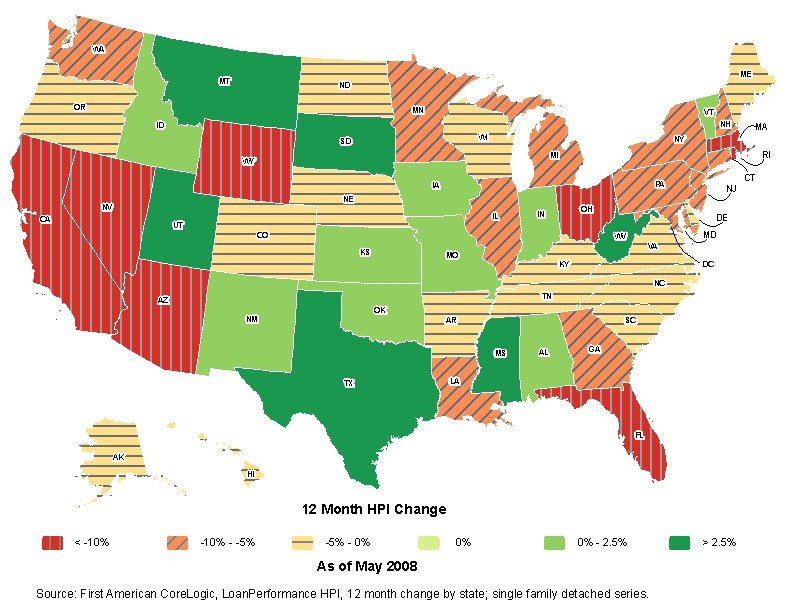 There is no good reason to assume home prices will rebound before 2012, and in fact prices might fall for much longer. In the meantime, most Option-ARM holders are only making the minimum payment with negative amortization increasing monthly. When those loans do recast, anyone in their right mind will hand over the keys. Is the Housing Market About to Get Even Uglier? Is Atlanta just as hosed as Las Vegas? A quarterly survey of housing-market data in 28 major metro areas shows sharp drops in the number of homes listed for sale across the country. But the potential supply of homes is far larger because banks are likely to acquire significant numbers of foreclosed homes in some areas, notably Las Vegas, Atlanta, Detroit, Phoenix, Miami and other parts of Florida, and Sacramento, Calif., over the next few years. The national apartment-vacancy rate in the third quarter was 7.8%, the highest in 23 years. Apartment rents may face further downward pressure as investors buy foreclosed single-family homes and turn them into rental units. If you are part of the 30 percent of American households who rent and you're trying to decide when to buy, relax. The market is still coming your way. Things are going to be awful for everyday people. They thought that if they had a bigger mortgage they could get a bigger house. They thought if they had a bigger house, they would be happy. It's pathetic. I've got four houses and I'm not happy. We need to return to the culture of thrift that my mother and her generation learned the hard way through years of hardship and deprivation. Have you seen "Revolutionary Road"? Hopeless emptiness. Now you've said it. Plenty of people are onto the emptiness, but it takes real guts to see the hopelessness. Dozens of US cities may have entire neighbourhoods bulldozed as part of drastic "shrink to survive" proposals being considered by the Obama administration to tackle economic decline. The US government is looking at expanding a pioneering scheme in Flint, one of the poorest US cities, which involves razing entire districts and returning the land to nature. Mr Kildee said he will concentrate on 50 cities, identified in a recent study by the Brookings Institution, an influential Washington think-tank, as potentially needing to shrink substantially to cope with their declining fortunes. "The real question is not whether these cities shrink – we're all shrinking – but whether we let it happen in a destructive or sustainable way," said Mr Kildee. "Decline is a fact of life in Flint. Resisting it is like resisting gravity." Flint wants to specialise in health and education services, both areas which cannot easily be relocated abroad. "Much of the land will be given back to nature. People will enjoy living near a forest or meadow," he said. Fundamental changes in American life may turn today’s McMansions into tomorrow’s tenements. Rewilding: the process of creating a lifestyle that is independent of the domestication of civilization. Building a new nation is never a straight, steady climb upward. Today can sometimes look worse than yesterday -- or even two months ago. What matters is the overall trajectory: Where do things stand today when compared to what they were five years ago? There are no rules and no regulations. Here, at Tent City, you are on your own. Look for similar towns to spring up all along the US side of the Mexican border, as migrant workers fall out of work but are afraid to return home because the situation across the border is even more perilous. This situation makes "drug war" reform all the more urgent. Kingston's gang-controlled neighbourhoods are just one result of a growing worldwide phenomenon: the rise of private "statelets" that coexist in a delicate, often symbiotic relationship with a larger state. Large sections of Colombia have gone this way, as have some of Mexico's borderlands and vast stretches of the Andes and adjoining rainforest. Nations such as Afghanistan and Somalia are more or less governed by warlords, and Pakistan's borderlands submit to Islamabad only when the state's armed forces force them to. And the list is growing. Wandering through many cities of the developing world today, one comes up against the limits of modernity. Vast metropolises, growing so quickly their precise populations are unknown, are dotted with shantytowns and squatter camps that lack running water, are crisscrossed by open gutters of raw sewage, and are powered by stolen electricity. Developing states are constantly struggling to catch up. In some places, they succeed, barely. In others, they are losing control of chunks of their territory. Still, although the weakness of the state today is most pronounced in the developing world, the state's retreat is also a global phenomenon. One of the strangest sights in Tijuana is a row of vintage California bungalows resting atop a hollow one-story steel frame. Once destined for demolition across the border, they were loaded on trucks and brought south by developers who have sold them to local residents. To squeeze them into tight lots, many homeowners mount them on frames so they can use the space underneath for shops, car repair and the like. On one site, a pretty pink bungalow straddles a narrow driveway between two existing houses, as if a child were casually stacking toy houses. Home prices continued to fall sharply in July, for a decline of 16.3 percent over 12 months, according to the Standard & Poor's/Case-Shiller index of prices in 20 major cities. There is no sign that prices have hit their bottom. The average Afghan spends one-fifth of his income on bribes. "I don't like statistics," she said. House prices rose 60 percent between 2000 and 2007 before the housing bubble burst. The question is whether the housing boom made people better or worse prepared for retirement. If they extracted the equity from their home through some form of housing-related debt and consumed all their borrowings, they will be left with additional debt and no additional assets and probably will be worse off in retirement. If they did not borrow and consume their equity, they will have more housing wealth to tap in retirement and will be better off. This brief explores how the rise in house prices affected individual households. The first section discusses the impact of an increase in house prices on the homeowner’s balance sheet and describes the evidence to date suggesting that the housing boom led to an increase in debt and to increased consumption. The second section uses the 2004 Survey of Consumer Finances (SCF) to explore the actual response of individual households. The third section discusses events since the 2004 SCF – the continued inflating of the housing bubble and its ultimate bursting in 2007. The final section concludes that a substantial proportion – perhaps a third – of older households will be less secure in retirement because of the housing bubble. Sometimes a picture is worth a thousand words….. I strongly recommend you not buy a house right now. Instead, rent a place, put your feet up, open a bag of chips, and watch the housing market crash. We’re not going to bounce at the bottom, we’ll stay there a while, so it’s not something you’ll miss. The dot-com crash of the early 2000s should have been followed by decades of soul-searching; instead, even before the old bubble had fully deflated, a new mania began to take hold on the foundation of our long-standing American faith that the wide expansion of home ownership can produce social harmony and national economic well-being. Spurred by the actions of the Federal Reserve, financed by exotic credit derivatives and debt securitiztion, an already massive real estate sales-and-marketing program expanded to include the desperate issuance of mortgages to the poor and feckless, compounding their troubles and ours. That the Internet and housing hyperinflations transpired within a period of ten years, each creating trillions of dollars in fake wealth, is, I believe, only the beginning. There will and must be many more such booms, for without them the economy of the United States can no longer function. The bubble cycle has replaced the business cycle.